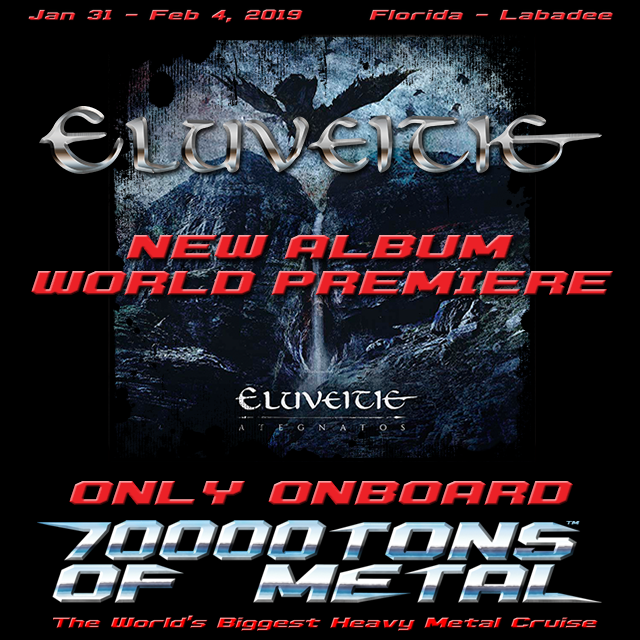 From January 31st (today) to February 4th, 2019, 70000TONS OF METAL, The Original, The World’s Biggest Heavy Metal Cruise, will host the exclusive World Live Premiere of Swiss Folk Metal band ELUVEITIE’s new album, “Ategnatos”. To celebrate the upcoming release of their full-length album, ELUVEITIE will perform songs from “Ategnatos” live for the first time ever on board 70000TONS OF METAL. The festival will also host an exclusive listening party for festival attendees who will be the first and only people from around the Globe to hear the new album in its entirety before its official Worldwide release on April 5th, 2019. ELUVEITIE mastermind Chrigel Glanzmann remarks, "We are happy and proud to give the first live impression from our upcoming album 'Ategnatos' on board 70000TONS OF METAL. We are also excited to present songs from our first metal album in five years before anyone else has heard it! We hope that you like the songs as much as we do." ELUVEITIE will also perform a second concert on board The World’s Biggest Heavy Metal Cruise along with 59 other International Heavy Metal bands to an audience hailing from over 70 countries around the Globe. 70000TONS OF METAL is The Original, The World's Biggest Heavy Metal Cruise, which features 60 Heavy Metal bands on board a luxury cruise ship performing across four stages, including The World's Biggest Open Air Stage Structure to Sail the Seas. The newly refurbished Royal Caribbean Independence of the Seas features a host of new amenities including dual waterslides, an Escape Room and a bungee trampoline. One of the biggest cruise ships in the World, it offers guests complimentary fine dining, bars, and lounges that never close, and 24 hour room service. With nine consecutive sellouts since the first voyage in 2011, this five-day, four-night Heavy Metal Music Festival, and Caribbean vacation offers 3,000 Metalheads a once in a lifetime opportunity to mingle side-by-side with 60 world class Heavy Metal bands. Every band plays twice and you get unrestricted festival access to 120+ live performances, including the Jamming in International Waters All-Star Jam, meet & greets with every band, intimate artist clinics & workshops, exclusive Album Premiere Listening Sessions and much more. All of this with no VIP areas on board makes it feel like everyone has a Backstage Pass. If that's not enough, festival goers even get a chance to explore a Caribbean dream destination with their favorite Artists. For more information on 70000TONS OF METAL 2019, including photos, FAQs (for booking, travel documents, payment, etc. ), vessel amenities, event details and more, please visit 70000tons.com.